For the first time in quite a while, I’ve taken a project from start to a complete finish in an enclosure. I wanted to have my prototype SSB QRP rig ready to take with me to Salmoncon, so I busted a move this weekend to tweak the last bits of the circuitry to my liking, build an enclosure, and get it properly mounted. You can see the results to the left. I have an assortment of Ten Tec enclosures on hand, but none of them were large enough to accommodate the bulky circuit board that I used, so I had to fabricate my own out of copper clad based on the WA4MNT instructions (such as AA7EE did with his wonderful CC-20 beta build). I would say that my mechanical construction skills are average at best, so it’s not the nicest looking enclosure, but I guess it’s OK for a first try (the perfectionist in me sees lots of flaws). The two-tone blue and grey doesn’t look too bad from a distance. Regardless of the aesthetics, the final enclosure is quite sturdy and will work well to keep the radio safe. 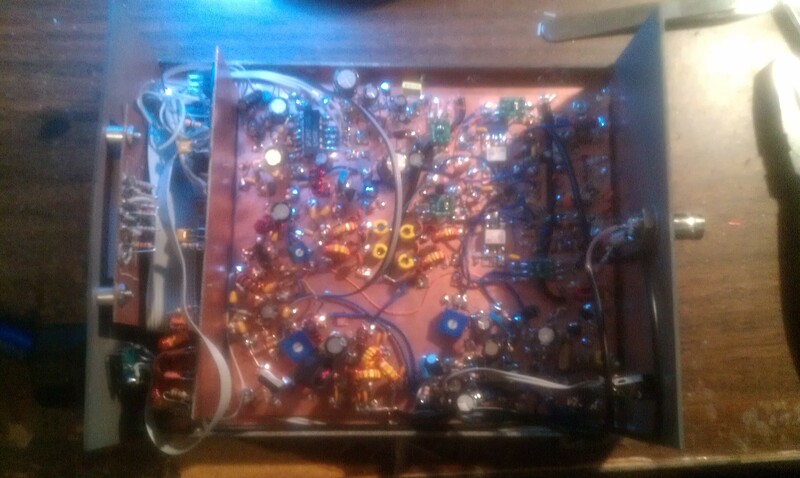 Here to the right, you can see the insides of the radio (sorry for the crummy photo, it was taken with my phone). The mainboard is the one laying horizontally and filling most of the room in the enclosure. To the left of the mainboard is the microcontroller/DDS board, standing vertically. Crammed in right in front of that, is the 4-digit LED frequency display and all of the other controls. Unseen and in the top cover, is a 1 watt, 8 ohm speaker. The LM380 AF amplifier can easily drive it to room-filling audio. I haven’t measured any of the important RX specifications yet, but I’ll give you some subjective operating impressions. Compared to my IC-718, the sensitivity is very close. Maybe a few dB down but not much. Noise seems pretty good, a bit better than the IC-718. A rough guess of dynamic range and intermod distortion is that it is decent as well. Haven’t heard much in the way of distortion products or “crunching” in the pileups that I’ve tuned through. There’s no AGC, so you can listen to some pretty weak DX signals, then have the local guy replying really blast through but sound relatively clean. Since the architecture is based on ADE-1 mixers and low-noise MMIC IF amplifiers, it’s what you would expect. 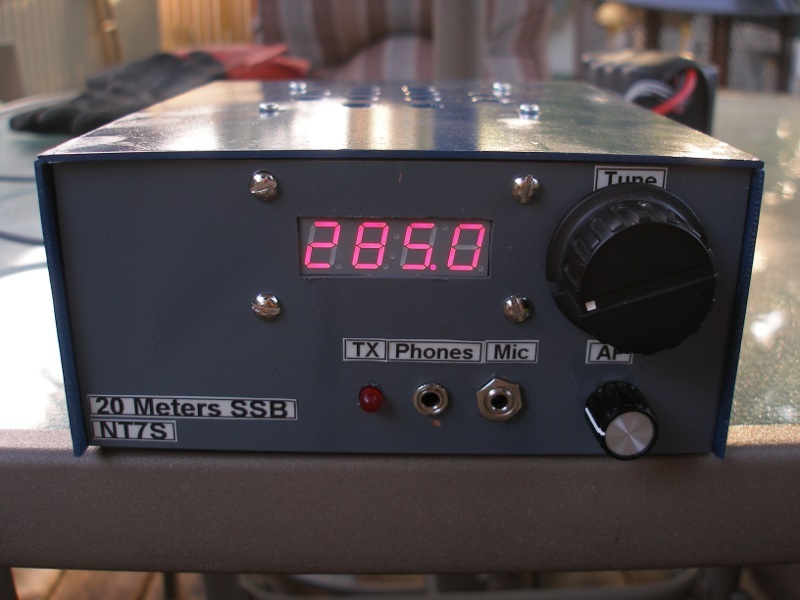 There’s no preamp, but that doesn’t seem to be much of a handicap on 20 meters. In fact, I think it would probably be counterproductive, especially since you probably aren’t working any stations that far into the mud that you need a preamp to hear them. As I previously alluded to, my mechanical skills are a bit suspect at times, so I needed to have a test QSO with the radio once it was all buttoned up to make sure that it was working correctly. So I did a bit of tuning around at about 9 PM local and heard K2L, the South Carolina station for the Original 13 Colonies special event station, thumping my speaker off at well over S9. He was working stations at an easy clip with fairly short exchanges, so it was perfect for a quick test. I snagged him on the first call with an honest 59 report (at least I think it was honest…I heard him giving other stations lower reports so I assume I was really a 59) with approximately 8 watts PEP into my ZS6BKW at 30 feet. Mission accomplished! It will be fun to take this rig to Salmoncon for some camping portable operation. I’ve never attended a Salmoncon before, but I think any of the attendees can use the special K7S callsign, so maybe I can do some CQing on 20 meters SSB with the short call and attract some stations. We won’t be up there until Friday evening, so I think we’ll miss the SOTA runs, but hopefully I can also get the radio out to a SOTA peak near here when I return. It might be too ambitious, but before Salmoncon I would also like to finish a 40 meter CW rig based on my Clackamas design that I entered into the 2010 FDIM contest. We’ll see if I can actually pull that off. Stay tuned for more news on Salmoncon as it gets closer and hopefully I can get a video of the SSB rig on YouTube so that you can see it in action for yourself soon. The rig looks great Jason. Now I know why we haven’t heard much from you in the last few days! You and I have been going in opposite directions, as I have been veering away from my usual modus operandi of putting my projects in enclosures. I’ve been leaving a few as partially finished boards, but hope that the next one will make it to the stage of being a completely finished project. Glad to learn a new SSB rig might emerge in yor catalog Jason. RE: the low-noise MMIC IF amp — what part? That I.F. stage might draw 1/3-1/2 of your receiver quiescent current? Yeah, each MMIC draws about 20 mA, so that’s a good portion of the Iq right there (I have two in the IF, but I also have one in the DDS VFO). I have used two different ICs: started with a Triquint AG203-63 but that’s in a very tiny package, so I tried a RFMD SGA-2486 in a more friendly package. Both work very well. Greetings from Spain. I would love to have a peep on this rig and the CC-20 schematics… Is there an online shop or any page listing kits and prices?